Compassion Community Clinic is looking for volunteer dentists. If you enjoy helping people get out of pain and putting a smile back on their faces. then CC Clinic would love to talk to you. CC Clinic is a faith based clinic that offers free dental care to low income adults with no insurance. We are open 3 clinics per month - 2 Saturdays and 1 Friday. 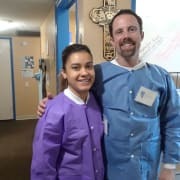 If you can spare just 5 hours every quarter and would love to give back to the community, please check out our website at www.nvccclinic.org for an application and more information. 5 hours per quarter or more often if available. Secured State of Nevada Dental License and a heart for people and our community.